We recently had the chance to review an ornament and a cookie care package from the American Lung Association Christmas Seals campaign. "You may be familiar with the American Lung Association’s yearly Christmas Seal campaign which mails Christmas Seals directly to millions of Americans each holiday season. 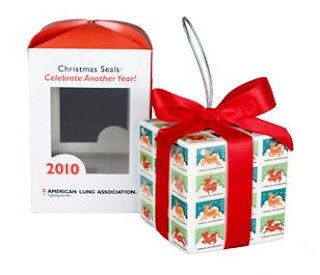 Now, in addition to the Seals, the American Lung Association has fun holiday gift items including gift wrapping paper and tags, holiday cards, collectable 2010 ornaments, and new exciting items for 2010 including the “Christmas Cookie Care Package” which includes cookie cutters, an apron, and a delicious sugar cookie mix. You can spread holiday cheer and feel good knowing that your holiday gifts support the work of the American Lung Association!" "What better way to enjoy the holidays than with freshly baked cookies! 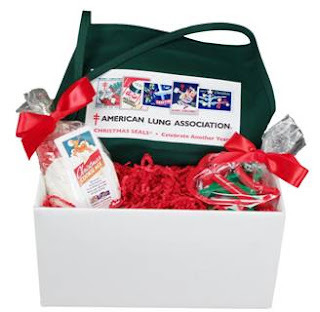 Enjoy this special Cookie Care Package from the American Lung Association this Christmas. It includes three Christmas-themed cookie cutters, the Christmas Seals apron and an 11 oz package of sugar cookie mix with red sprinkles. Get the whole family baking a delicious holiday treat! The Christmas Cookie Care Package comes in a festive white box, perfect for gifting. - Cookie cutters are top-rack dishwasher safe and come in the following shapes: Santa Hat, Christmas Tree and Holiday Bell. - Apron is sturdy and machine-washable with the festive Christmas Seals design on the front. - Cookie mix yields 2 dozen cookies and has an 8-10 month shelf-life. - Cookie mix contains wheat flour, malted barley flour, cane sugar, vanilla extract and orange extract, and is produced in a nut-free factory." "Brighten your tree with this 2010 Christmas Seals Collectible ornament. This jolly ornament, shaped like a present with a festive red bow, features Santa's very own reindeer: Rudolph, Dasher, Dancer, Prancer, Vixen, Comet, Cupid, Donner and Blitzen. This ornament is sure to make a great gift for loved ones, or hold a special place on your own tree!- Comes in American Lung Association Box- Unbreakable custom shape poly ornament"
What we thought: We had a lot of fun with the Cookie Care Package. The cookies were delicious and used an easy-to-follow recipe and minimal ingredients(water, butter and the cookie mix). The cookie cutters worked perfectly and the apron kept us stylish and clean:) The package came beautifully wrapped and would be the perfect gift for a family with children or anyone who loves to bake. It could also work for a college student far from home who has access to an oven, but might not have a lot of baking ingredients on hand. The Christmas Seals ornament was really cute and would be perfect for anyone really, but especially someone who collects ornaments. They would also make great Secret Santa, co-worker and neighbor gifts. You can give these gifts to anyone on your gift list and be happy knowing you won't break the bank and you're supporting a great cause! ABCD Diaries gives the American Lung Association's Holiday Gifts an A+!! Buy It: Find great holiday gift ideas and support a great cause at ChristmasSeals.org!! Disclosure: ABCD Diaries was given a cookie care package and an ornament for review purposes only. We were in no other way compensated. The opinions expressed in this post are ours and ours alone.